Entrance: At the end of Hengstepad. 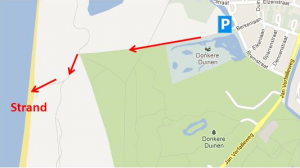 Behind the beautiful nature and recreation forest “Donkere Duinen” you will find the beach, which has the same name. This beach can only be reached on foot or by bike. The advantage: it is a very nice and especially quiet family beach. The walk back is quit a climb through the sand, when heavy loaded or not fit we suggest you take Duinoord beach. This beach has no facilities. 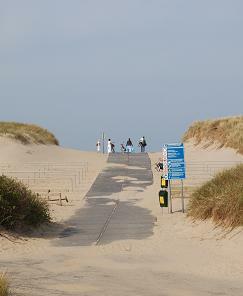 Toilets and restaurants can be found at the adjacent beach entrances Huisduinen and Duinoord. These can be reached on foot along the beach. This is an unsupervised beach. In the summer season lifeguards patrol this beach regularly. 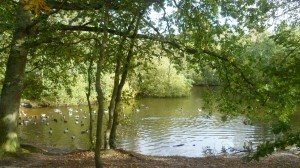 The dunes and forest contain a number of cycling and walking routes. Information is available at the tourist office of Den Helder. This area used to be the property of the Counts of Egmond. (“Grafelijkheidsduinen” means “Dunes owned by the Counts”.) . The area was later used to extract drinking water. When this stopped in 1982, a beautiful area with dune lakes arose. 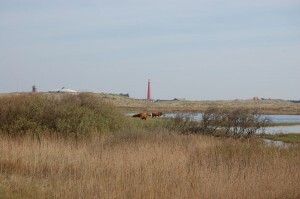 Now the area is managed by Landscape North Holland. In the part that is closed off, Highland cattle and Konik horses are kept. The walking and biking trails in the area are freely accessible and in the summer trips are organized by Landscape North Holland. The beach can easily be reached by bike or on foot. By car this is tricky. At the beginning of Hengstepad there is a limited number of parking spaces. From there it is a walk of about one kilometer to the beach.